A really great vegetarian lasagna recipe is a gem to find as this hearty casserole is popular with nearly everyone. These versatile vegetarian dishes can work as satisfying entrees or accompaniments, and are popular for both entertaining and homey family meals. Because of the filling noodles and high fiber veggies these lasagnas contain, those who prefer more traditional fare may not even miss the meat. Grease a 13" x 9" baking pan or similarly sized casserole dish. Place layer of lasagna noodles to cover the bottom of the pan. Top the noodles with a layer of each kind of cheese and the chopped spinach. Spread a thin layer of sauce over the cheese. Repeat the layering twice, topping with a fourth layer of noodles. Pour pasta sauce over the top. Sprinkle with parmesan, mozzarella or a combination of both. Place in oven and bake at 350° for approximately 45 minutes. Note: *You may substitute 2 packages of fresh spinach,. Blanch it by dipping it briefly in boiling water, then in cold water, drain it and chop it. Chop the zucchini, squash and bell pepper into bite sized pieces. Saute the vegetables in olive oil and set aside. Spoon enough sauce over the bottom of the pan to coat it. Use a spatula or knife to spread ricotta on enough uncooked lasagna noodles to make a layer in the pan and place them, cheese side up in the pan. 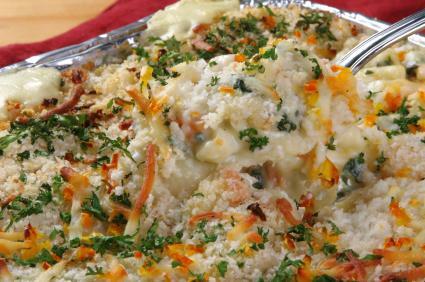 Spoon a layer of cooked vegetables over the noodles, then top with a blend of mozzarella and parmesan. Repeat the layering until the lasagna is near the top. Cover with non-stick aluminum foil . Place in oven and bake at 350° for approximately 30 minutes; uncover and continue baking for 15 more minutes. There are a number of ways to make the dish. Consider the following popular vegetables to make variations of basic lasagna recipes. Substitute these for the vegetables in the recipes above, or add combinations of them for rich flavor medleys. Lasagna noodles come in a variety of types. 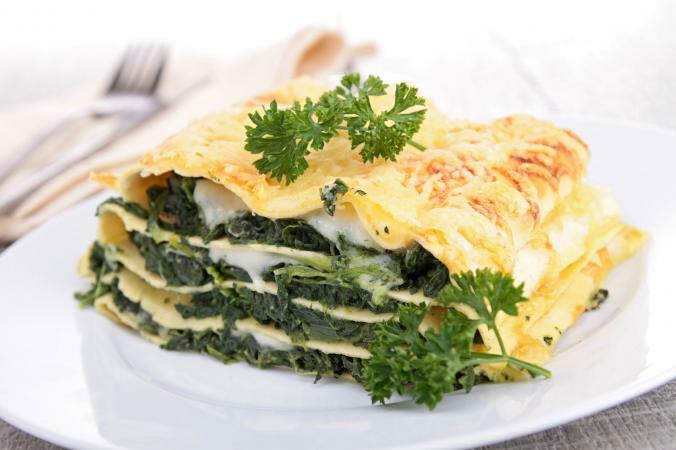 From whole wheat to plain white and gluten-free noodles to egg-based varieties, a number of staples make vegetarian lasagna variations that will suit any number of eating plans or nutritional sensitivities. Some people choose to use rice or polenta in place of noodles to completely reinvent the dish. For quicker variations, try using some of the noodles that do not need to be pre-boiled. Once you're figured out what vegetables and noodles you'll be using, it's time to add the cheese. Again, variety is the spice of the dish, so feel free to combine types or make unconventional choices. Cottage cheese - The benefit of using cottage cheese is that it has many flavor and fat varieties. It's possible to use nonfat or low-fat cottage cheese for a healthier dish. Mozzarella cheese - One of the most popular lasagna cheeses, shredded mozzarella melts and blends well with vegetables and pasta. Ricotta cheese - Much like cottage cheese, this creamy variety works well in lasagna and adds a bold, rich flavor. Cheese blends - Parmesan-mozzarella and Mexican cheese blends both work well in lasagna and provide a unique flavor. Keep in mind that you can almost always substitute low- or non-fat ricotta, mozzarella and other ingredients to keep the calories lower if you are watching your weight. Though tomato sauce is the most popular sauce used in lasagna, some people use pesto, cream sauces, cheese sauces, or even salsa. With so many varieties and so many options, it's easy to create a recipe that is all your own and that friends and family, both vegetarian and not, will truly enjoy. Tired of traditional red sauces or not fond of tomato-based sauces? Use a creamy Alfredo sauce to make a white pasta or a vibrant pesto for a "Lasagna Verde." Want to make a vegan variation? Substitute tofu-based cheese and soft tofu for the dairy products in either of these recipes. Chop fresh basil, oregano pr marjoram and sprinkle it in with your lasagna layers to enliven the flavor. Lasagna is the quintessential one-dish meal and there is no "right" way to make it as long as it has succulent layers of nutritious ingredients. Experiment to find the perfect options for your family table.